One thing that I am really looking forward to this Christmas season here in General Santos City is the first-ever pyrotechnic competition. Yup, you read that right! 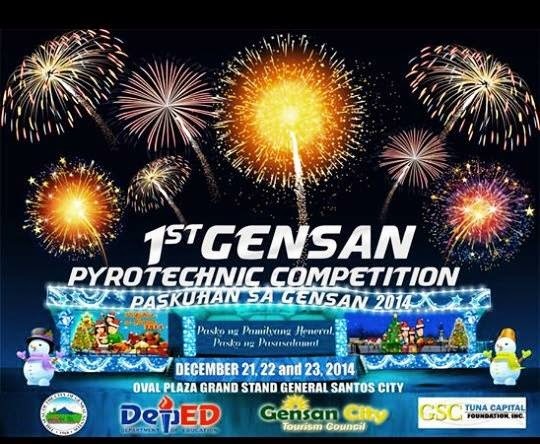 The City-LGU through the Gensan City Tourism Council is holding the 1st Pyrotechnic Competition as part of Paskuhan sa Gensan 2014. It will be happening from December 21-23. A total of six (6) competitors coming from various places in Mindanao are set to light up the night sky at the Oval Plaza for three (3) consecutive nights. "It's never been done before, and we are anticipating a show not to be forgotten by the generals and our visitors", said Jonhel Rillo, event manager for the 1st Gensan Pyrotechnic Competition. So mark your calendars and be with the whole family at the Oval Plaza. Happy Paskuhan sa Gensan 2014! Post by I love South Cotabato.